I’m assuming since you’re reading this post, that you want to achieve big things for your business. To attract the right customers and grow that business of yours. So, what are your plans? And, since I write about all things branding and marketing, I’m specifically referring to how you plan to market your biz. I’m assuming that you have the skills, experience, and determination to make these big things happen, but you might need a little help getting started. You’ve come to my little brandstand for some good, old fashioned marketing advice. I want you to succeed and, some may mock me for this—I truly believe you are changing the world and making it a better place because of what you do. And be forewarned, this post is not going to be about how to segment your email list, kill it on Facebook, or implement automated conversion funnels. So, how will your brand stand out? Spot on marketing is about serving the type of customer you want to help. It is not about segmenting your email list, killing it on Facebook, or implementing automated conversion funnels—not yet at least. What I mean by this is that trying to implement the latest and greatest marketing tactics is completely counterproductive unless you know who you are, who you aim to serve, and have a strategy to do so. That is step one, my friend. Knowing who you are, who you are talking to, and crafting a marketing message built to engage these people. It’s not rocket science, but I can’t tell you how many small business owners who’ve approached me over the years with 100% of their focus on tools and tactics vs strategy. Meaning they wanted me to redesign their website, but when I started asking certain questions they didn’t have the answers. Have you clearly articulated your uniqueness and how you are going to help said person? Have you outlined a marketing system that gets them from start to finish? And how does this relate to you and your goals? And, where you want to be in two years? Good marketing strategies rock it if done right. But you must first do something for me to get moving in the right direction. STOP. Now visualize the future of your enterprise. Where do you want to be in a few years? Who will buy from you? Why does this matter? And how will you get there? If you’re starting out, this step is kinda sorta super-duper crucial. Meaning you CAN’T skip this part. Because, if you want to grow your brand through marketing done right, you must first be 100% certain where you want to be. You want to clarify your message. Does your brand convey exactly what you do? Attract your ideal customer. Are you telling the people you should be working with how you will help them? And show them what to do next. After you’ve clarified your brand DNA, and started focusing on your ideal customer, is it clear to them what they need to do next? Pick up the phone? Fill out a form? Download your slammin’ eBook? For your brand to bloom and your business to flourish, you need a clear idea of where you want to be. With this vision, it’s waaaaay easier to develop marketing built to grow your business. How do you sketch a clear image of your future business? a. Ask yourself key questions. Where do you want to be in 2-3 years? And what will steer you in the right direction? How will you stay on course? It’s amazing what a few simple questions can do. This means combining your big, beautiful visions with SMART goals: Specific, Measurable, Attainable, Realistic, and Timely. Think big. Focus on the things you want to achieve asap, as well as the longer-term stuff. But, don’t get too deep into this because that’s how you get lost in the weeds. Dream big. Have monster goals. Big, fat, imaginative goals…. Having an unusually large goal is an adrenaline infusion that provides the endurance to deal with the trials and tribulations that will inevitably come. c. Picture the customer you want to work with. Build a simple customer profile of your perfect customer. Start by looking at current customers. What are the traits of your very best customers? 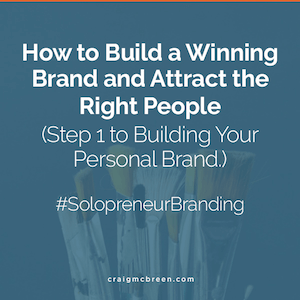 List common characteristics of the most ideal, then create a profile of the peeps who are the best fit for your business. d. Act like a kid, and draw out the future vision of your business. Take a, b, and c and put your vision to paper. In two years where will you be? In three? In five? Think about that unusually large goal. What are your values and how will they fit in? What motivates you and how will you use that to motivate others? What ignites you? And how can you combine the thing that lights you up with your skills? This, my friend, is where you discover your core, learn to tell your story, and ignite your brand. Your biz will appeal to the right audience, you’ll start to grow that brand of yours, and you’ll soon turn your baby into something special! To fully carry out your mission follow a few fun rules. I know, this sounds like the “be epic” drivel you always read about online. But what I mean is this… When asking questions, or focusing on your larger goal, or simply daydreaming (you are allowed ;)), focus on the uncommon you (your unique offering). Hey, I’m a classic introvert, but I don’t think I’m boring. I just need to focus on the things I do best and different than others. Then frame it in a distinctive way. This is how you get people to take notice. If you want to build a great brand, treat marketing as a systematic process. John Jantsch over at Duct Tape Marketing is a wizard at solving the most frustrating part of marketing. Be consistent. Marketing is a system. For any good system to work it needs to become rote. Make marketing a habit you fit into your day. Build baby steps. Take them daily. And pretty soon people will come to like, know, and trust you. They might also not only buy from you but help you with the type of word-of-mouth marketing that leads to growth. Create a system for marketing. Create a set of daily processes, and get busy.